Several years ago, before the world really caught on to the internet, there were shelter magazines. Remember them? 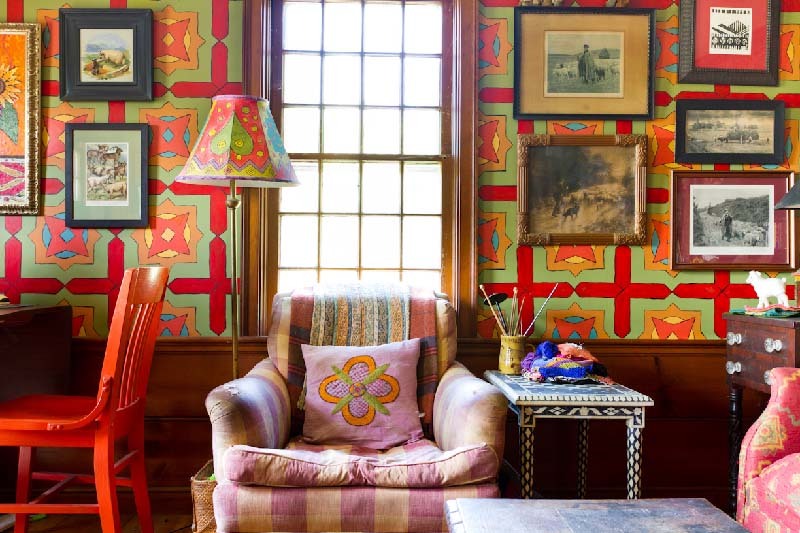 Back in 2003, I had contacted Country Home, one of my favorite decorating magazines about the way I had decorated our 1751 farmhouse with hand-painted decorations. They fell in love with our home and set up a date for a photo shoot. Shortly before the shoot, I decided to act upon an idea I had been dreaming of for a long-time - a faux wallpaper treatment in our "green room." If I were to do this treatment now - in the days of popular DIY culture and "show everyone everything you make and do on Instagram" I would have better photos. But I don't - I have the ones I shot on a film camera in 2003 as I was working on my wall treatment. I just stumbled upon them when I was cleaning things up here before my class in May and thought you all might be interested. Apologies for the lack than stellar photos. 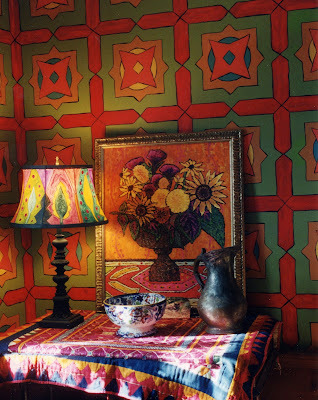 I have always loved wallpaper. My tastes go towards very expensive ones made with several screens. Like these. They are beyond my budget. What's a girl to do but paint it herself. 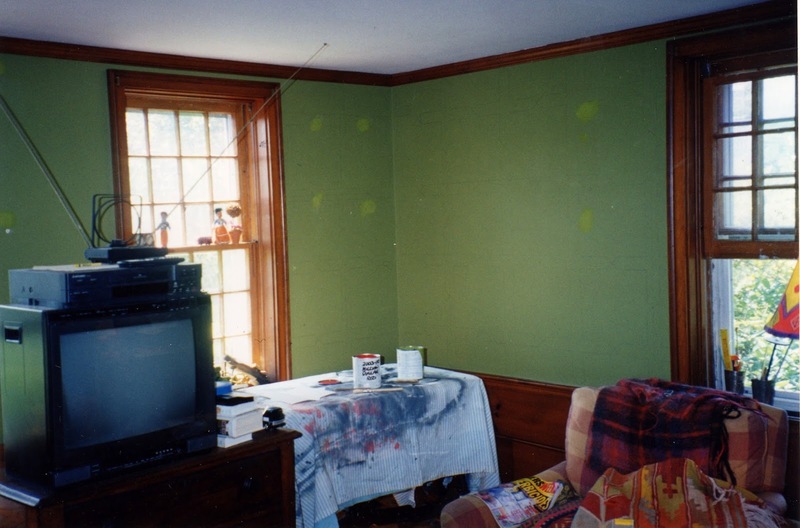 The room was already painted a mossy green. 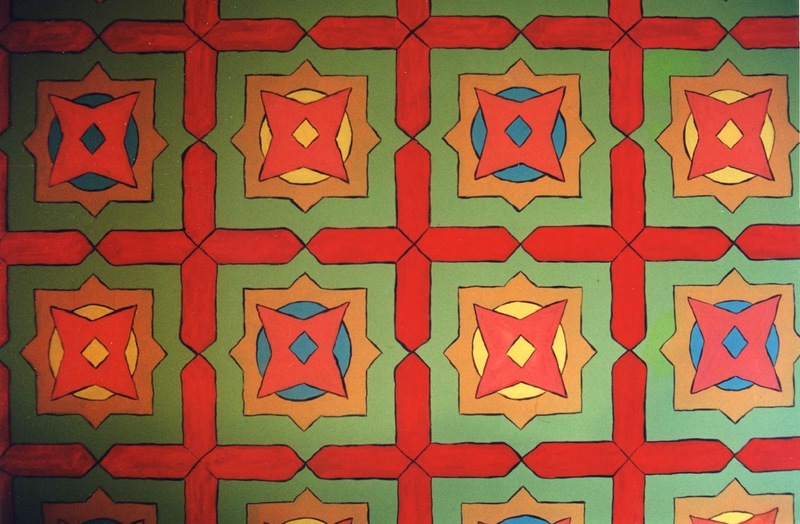 From this illustration, I designed my own wallpaper design. Instead of printing it, I thought it would be easiest to make cardboard templates to trace around. 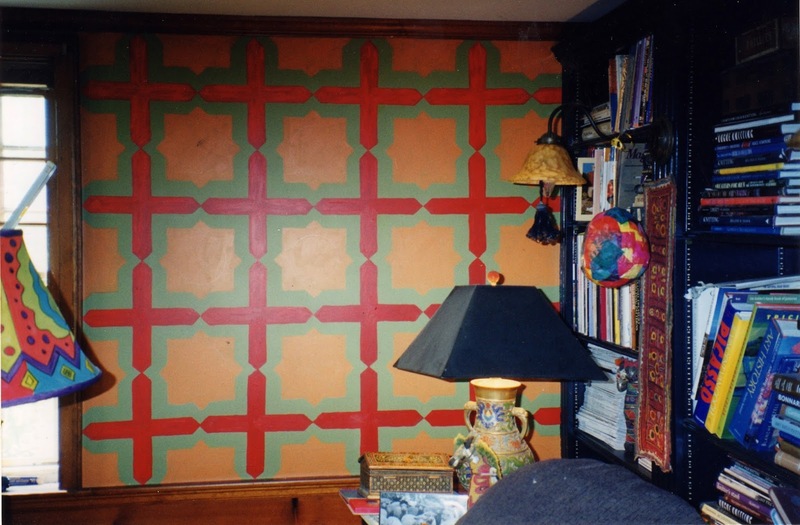 This would give me repeating shapes that were all the same size (as opposed to my mural in the dining room which was painted freehand). I drew out the designs on graph paper. 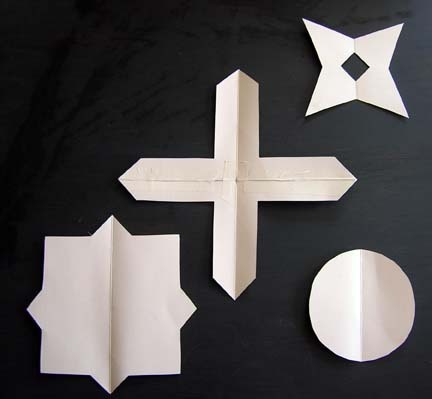 I traced the designs onto some Fedex cardboard envelopes because they were in the closet and handy. 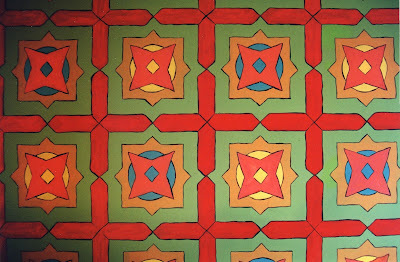 As you can see in the photo below, I simplified the tile inspiration pattern quite a bit. I began at the corner of the room. 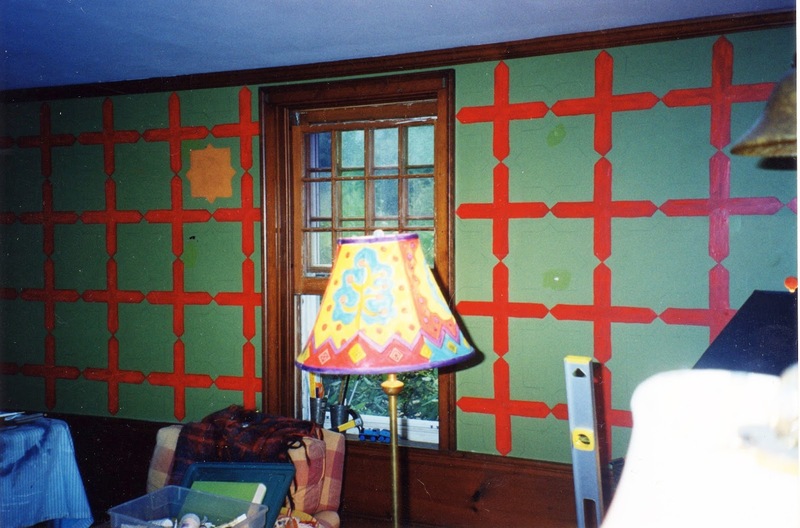 Using a long level, I drew a plumb line so that my cross motif would be straight all the way down the wall. Using a plain old pencil, I traced around the cross (former Fedex envelope) template. With red acrylic paint, I painted all the crosses. Next up was the square shape that had projecting triangles. The little triangles fit right inside the the pointy end of the crosses so it made alignment quite easy. 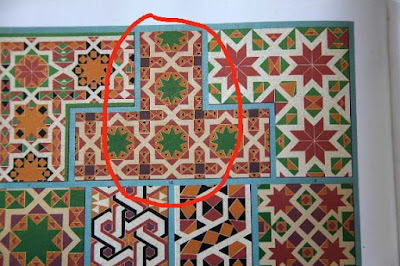 For this motif placement and all the remaining motifs, I just eyeballed their placement. Once again, I traced around the shape and then filled them in with an apricot color acrylic paint that I mixed. The next part of the design was the circle motif that went over the square. I decided to alternate the colors between turquoise and butter yellow. Lastly I added the triangled cross motif on top of each circle. I do not have an in-progress shot of that step. 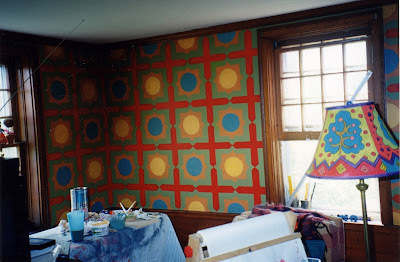 Once all the colors were painted, I outlined each motif using a large "liner brush" with black acrylic paint. I love using liner brushes because you can vary the pressure on the brush and make a line that has variations in it. Here is the finished "wallpaper." Here you can see it once I got some artwork and accessories placed. Here are two more photos by Rikki Snyder as the "Green Room" looks now. I still am very happy with the way this project turned out and I have no plans to change it. I love the warm and rich colors. In the winter, when we use this room most, it is so cosy and enveloping. I know this is because of the colors I used, the design, the fabrics used on the furniture and the collection of books that is on one of the walls. The woodstove doesn't hurt either! You can find many DIY projects - from painting, printing, fabric, knitting, embroidery, and more - in my book Crafting a Colorful Home. It is available signed on my website here. I am still offering FREE SHIPPING, a free Kristin illustrated bookplate and a set of postcards all free when you order from me. To see more of our colorful farmhouse, check it out on the Houzz.com website here. Kristin I still have that magazine. Every once in awhile I will open it up and browse through the pages. It always makes me happy and gives me inspiration. Thank you for sharing more about your design process! It's inspiring!! Just want to say that I think you're so amazing. Kristin, thank you so much for showing all these steps you took to create this fabulous wall covering. I found it intriguing that you had the sense of both the scale and color way of the tile-inspired design that would be so beautiful on the walls of this room. Yes, the cosiness of this room would make it a place in which to linger in winter. But seeing it on this hot June day, I must tell you that it still looks very welcoming! wonderful. love it. 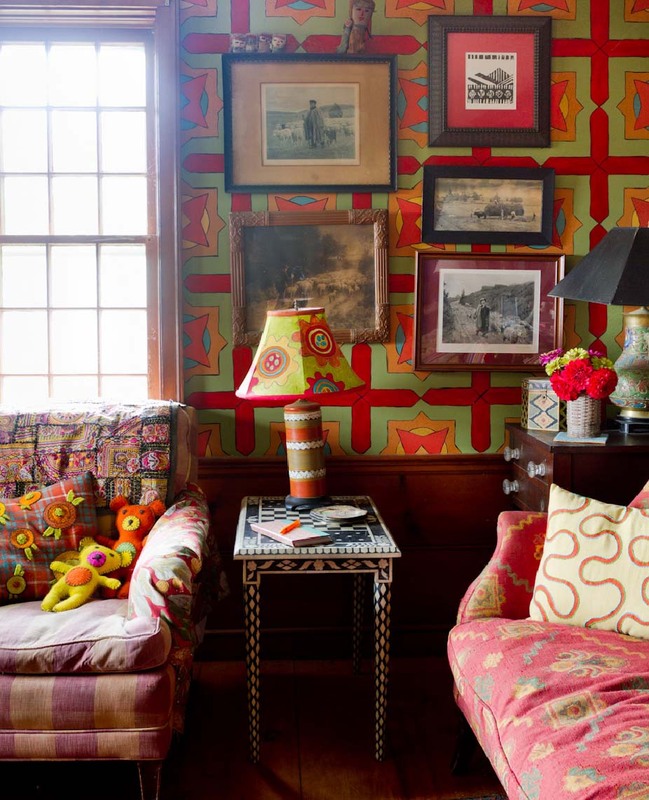 I recently discovered your gorgeous house on Houzz. I'm a big fan, waiting for your book to arrive.